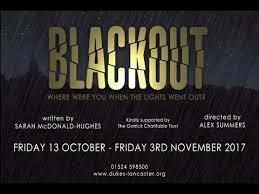 Our Part in Performing the Production of "Blackout"
​The Dukes theatre in Lancaster, Lancashire, produce a variety of professional live theatre and also show mainstream and cultural cinema screenings. ​At 10.45pm on December 5, 2015, Storm Desmond plunged 100,000 people in North Lancashire into darkness, lasting four days for many. At the storm’s peak, 1,742 cubic metres of water per second flowed down the River Lune in Lancaster – the highest flow of any river ever recorded in England. This play was a thrilling account of those who weathered the storm together during the power blackout of unprecedented proportions. It tells the tale of the ensuing chaos, bewilderment and camaraderie they experienced as their communities were cut off from the modern world without communication, transport or information. 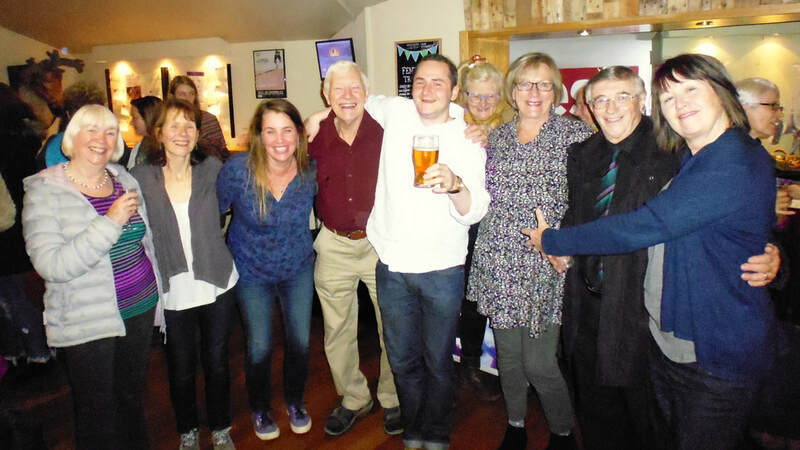 Blackout was an original play inspired by testimony from residents, community organisations, emergency responders, sociologists and journalists, telling the stories of ordinary lives in extraordinary times during the Storm Desmond power cut. Award winning Manchester-based writer Sarah McDonald-Hughes focused the play’s attention on the real-life experiences of a Lancaster business owner who saw her shop devastated by flood water, a young homeless woman from Morecambe wandering the streets during the blackout and a schoolboy who lost his most precious possession to Storm Desmond. It was created with and performed by local people, with backing music provided by members of our choir who experienced the event. See "Our Story" below. Our Winter Concert of Handel's Messiah, in Lancaster Priory, on the evening of 5th December, 2017 will never be forgotten by our choristers and our faithful audience, thanks to Storm Desmond! As the day grew wetter and darker and the River Lune swelled, our reviewer rang to say that she couldn’t come to the performance as the water in her garden near Kendal was approaching her house! Our first clue as to what was to come! Amazingly, despite the torrential rain, our loyal audience turned out in good numbers and at 7:30 pm were all sitting in their seats waiting for the performance to start. This was when we realised something was amiss - we had no conductor! Both the choir and audience all sat patiently, waiting for our conductor to appear. As time went on, people started to become a little agitated and concerned for his well-being. We were extremely relieved when we eventually saw a very wet and bedraggled, tail-coated figure appear through the doors. Having negotiate fallen trees and flooded roads, he had managed to wade through Lancaster and toil up the steep Castle Hill to take his place on the podium. He cut a very sorry figure as he arrived! He walked up the aisle to the strains of “Here Comes The Bride”, courtesy of our organist, which set the lively mood for the night! He brushed himself down, tidied his appearance and quickly got the show back on the road! Hooray!! Well done John! After the concert had ended, people began to leave to begin their journey home. Little did they realise that Storm Desmond was now well and truly upon them and creating havoc outside the doors. The river had overflowed and and taken out the electricity sub station, causing power cuts across the city. Many bridges were now out of commission, all the lights in most of Lancaster and the surrounding area were out - including all the traffic lights. 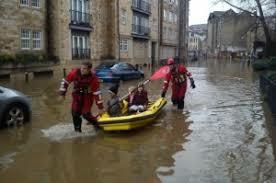 The bus station and low-lying parts of Lancaster city centre were flooded and circuitous routes would have to be found. Many intending to go north of the city instead had to drive south to Galgate and onto the M6 in order to drive back up north, to places such as Carnforth - where the exit roundabout was flooded. It was going to be a night to remember! Two days of The Blackout ensued.